Solubility of sulphur (S) in liquid iron (Fe) is quite high. But the solubility of S in solid iron is limited. It is 0.002 % in ferrite at room temperature and 0.013 % in austenite at around 1000 deg C. Hence, when liquid steel cools down, sulphur is liberated from the solution in the form of iron sulphide (FeS) which forms a eutectic with the surrounding iron. The eutectic is segregated at the iron grain boundaries. The eutectic temperature is comparatively low at around 988 deg C. Fe-FeS eutectic weakens the bonding between the grains and causes sharp drop in the properties of steel at the temperatures of hot deformation. During the continuous casting of liquid steel, sulphur present in liquid steel (i) causes the formation of undesirable sulphides which promotes granular weaknesses and cracks in steel during solidification, (ii) lowers the melting point and inter-granular strength, (iii) contributes to the brittleness of steel and thus acts as stress raiser in steel, and (iv) results in the hot shortness. Sulphur, present in solid steel as FeS inclusions, has several detrimental effects on steel processing. During deformation, FeS inclusions act as crack initiation sites and zones of weakness. Such inclusions from sulphur adversely affect the toughness, ductility, formability, weldability, and corrosion resistance of steel. An increase in manganese (Mn) content (not less than 0.2 %) however, helps prevent formation of FeS. Sulphur is thus an undesirable element in steel. Manganese actively reacts with iron sulphides during solidification of steel transforming FeS to MnS according to the following reaction. The melting temperature of manganese sulphide (MnS) is comparatively high (around 1610 deg C). Hence steel containing manganese can be deformed in hot state. However MnS inclusions (i) are brittle (less ductile than steel), (ii) may have sharp edges, and (iii) are located between the steel grains. All these factors determine negative influence of sulphide inclusions on the mechanical properties of steel. Since sulphur is one of the detrimental impurities in the steel affecting both internal and surface quality, desulphurization of steel is essential during the steelmaking process. Also ever increasing specification requirements for material properties of various steel grades have resulted in an extreme demand on steel cleanliness. For the production of clean steel, especially with regards to the precipitation of sulphides, it is necessary that the sulphur content in liquid steel is kept as low as possible. In practice, the removal of sulphur from liquid steel is mainly achieved in ladles during secondary steelmaking. In modern steel melting shops the primary steelmaking furnaces are primarily used for the treatment of hot metal and melting of scrap. All other metallurgical objectives, such as alloying, homogenization, refining and temperature adjustment, are performed during the secondary steelmaking process with control of top slag. There are several tasks which the ladle slag is to perform. It protects the liquid steel against oxidizing atmosphere on the one hand and is used to carry out metallurgical operations on the other hand. Therefore, the ladle slag is to have suitable physical and chemical properties which are characterized mainly by a low melting temperature, low oxygen potential as well as a high capacity for sulphur. The desulphurization of liquid steels with a refining ladle slag is one of the most important processes of secondary steelmaking. But process control is based on empirical guidelines even today. Deviations from the sulphur contents aimed at can often be observed in practice. An improvement of the process control supported by knowledge of the thermodynamics and kinetics of the desulphurization reaction is of great importance, especially for the production of steels with very low sulphur levels. There are four aspects which are important during the desulphurization of liquid steel. These are (i) sulphide capacity, (ii) sulphur distribution ratio, (iii) desulphurization potential, and (iv) rate of desulphurization. Sulphide capacity – It is the ability of liquid slag to adsorb sulphur. This is often characterized by the equilibrium between the slag phase and the gas phase with respect to sulphur and oxygen partial pressures. The sulphide capacity is a property depending only on the temperature and the slag composition. It can be directly measured by experimental tests under isobaric and isothermal conditions. The achievable data on the sulphide capacities of many binary, ternary and multi-component slag systems are available in the literature. The sulphide capacity of slag normally increases with rising temperature and concentration of basic oxides. Hence, highly basic ladle slags are to be used for steel desulphurization. Different mathematical models have also been developed to calculate the sulphide capacity of multi-component liquid slags. Sulphur distribution ratio – Sulphur is distributed between the metal and slag phase at equilibrium. The sulphur distribution ratio normally depends on the oxygen activity in the liquid steel. Steel desulphurization becomes more effective with the decreasing oxygen activity. Desulphurization potential – Desulphurization potential is also a function of the slag composition. To characterize the slag behaviour a lime saturation index defined by the ratio of the actual CaO (calcium oxide) content to the CaO content for lime saturated slags is generally used. The ‘lime saturation index’ changes with the slag composition. The lime saturated index value for lime saturated slag is one. Slags with a lime saturation index of less or more than one are under-saturated slags or slags with a surplus of lime, respectively. 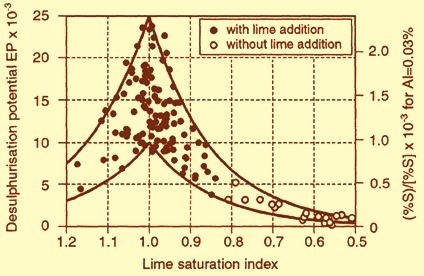 The influence of lime saturation index on the desulphurization potential is shown in Fig 1. The highest desulphurization potential can be achieved by using lime saturated slags. An under-saturation of lime in the ladle slag leads to a decrease in desulphurization for thermodynamic reasons. As opposed to that, a surplus of lime leads to heterogeneous slags, resulting in a decrease of the desulphurization potential for kinetic reasons. Therefore, an optimization of the slag composition is required to ensure a satisfying removal of sulphur from liquid steel. Desulphurisation rate – The sulphide capacity as well as the desulphurization potential describe the maximum ability of slags to absorb sulphur at thermodynamic equilibrium. In practice, there is a ladle treatment time which is required to be adapted as per the production requirement of the steel melting shop. A rapid refining process in the ladles is desirable. It has been seen that at steelmaking temperatures the reaction rate between the metal and the slag phase is mostly determined by the mass transport. As regards steel desulphurization with a refining ladle top slag, the reaction rate is dependent on how fast sulphur is transported from the metal phase to the metal/slag interface and how fast it is transported away from the interface into the slag phase. In this case a rapid mass transfer caused by intensive gas stirring leads to an acceleration of the desulphurization rate. Today the gas stirring treatment of liquid steel in the ladle is a standard operational practice. For the performance of gas stirring treatment, inert gas (normally argon gas) is injected into liquid steel through porous plugs located in the ladle bottom or using a submerged top lance. The injected gas ascends in the liquid steel in the form of gas bubbles and is separated on the bath on the surface. Because of the buoyancy force of gas bubbles a circulating flow field of liquid steel is formed in the ladle. The pattern of the steel flow field is of great importance for the desulphurization process. The flow velocity of liquid steel increases with the increase of the stirring gas rate. Hence, an acceleration of reactions between the steel and the slag phase can be achieved. The desulphurization rate increases considerably if the gas stirring rate exceeds a critical value. This phenomenon can be caused by emulsification of slag droplets into the metal phase. Liquid steel desulphurization by slag-metal reaction is an exchange reaction between two non-miscible phases, thermodynamically governed by the sulphur partition ratio between the two phases, and kinetically governed by the inter phase exchange area and sulphur transfer driving force. The kinetic aspects can be suitably influenced by fluid dynamics effects. Since proper bath stirring induced by gas injection affects the relative velocity at the interface of metal and slag, it, in turn, affects the solute mass transport coefficient. High interface velocities can even cause slag emulsification, resulting in a great increase of exchange surface area. Moreover, efficient metal mixing in the liquid steel bath makes faster the attainment of the desired final sulphur level in the liquid steel, resulting in a decrease of the duration of desulphurization operation. Knowledge is hence needed of in-ladle fluid-dynamics induced by gas injection, in order to reach the best conditions in terms of suitable flow field namely (i) at the metal-slag interface, to favour emulsification and, in turn, acceleration of the chemical kinetics, and (ii) in the ladle bath, in order to allow the mixing of just desulphurized steel at the interface with liquid steel in the ladle bulk up to reaching perfect mixing throughout all the ladle at the target sulphur level. On the other hand, too intense stirring actions which are related to high operational costs and bath temperature losses, are to be avoided. Mechanical energy is transferred to the bath by means of (i) bottom blowing, from one or more porous plugs, (ii) top blowing, through lance, or (iii) combined blowing. Several investigations have been performed on the effects of gas stirring on in-ladle fluid-dynamics, focused on the gas path or on slag-metal interface processes, involving desulphurization reaction as well. The most relevant aspects arising from these investigations are the following. In several steelmaking processes in which bath stirring is concerned, mixing times depend on the power transferred to the bath in the ladle at the power of 0.3 – 0.4. The mono-plug bottom blowing stirring which ensure the shortest mixing times for a fixed bath and a fixed gas flow rate supply is achieved with plug eccentrical with respect to the ladle. A position between quarter and half ladle radius is generally desired. Multiple porous plugs stirring in the ladle is to be set carefully in order to have the relative velocity at the interface slag-metal to favour emulsification. Asymmetrical plug positions proved to be of maximum efficiency in reducing mixing times. With symmetrical plug positions, flow recirculations are induced in the ladle with zones which have counteracting flows destroying their stirring effects. Lance blowing is beneficial for emulsification, whereas bottom stirring is beneficial for ladle mixing. A suitable combined blowing merges the two desired effects. Studies carried out on the effect of the slag properties on the emulsification phenomenon show that there are critical conditions which are required to be met for steel velocity at the interface with the slag and flow rate of gas blown from the plugs to allow emulsification onset. These relationships take into account slag physical properties such as viscosity and density. Among the parameters used to define improved conditions for mixing in the ladle and mass transfer at the slag metal interface, of great importance are the ratio between ladle diameter (D) and the bath height (H). Normally, the ratio D/H is not far from 1. Data available in literature on the effect of gas flow rate injection on desulphurization rate show that the most interesting aspect is that an onset gas flow rate is to be found for enhancing significantly desulphurization rate. Primarily, there are two options available for the removal of sulphur from the liquid steel. These are (i) by means of metal-slag reaction, where the top slag is mixed intensively with the liquid steel, and (ii) by injection of metallic calcium (Ca) into liquid steel, where a precipitation of sulphides occurs. The ladle top slag after primary steelmaking normally consists of (i) slag carried over from the primary steelmaking furnace, (ii) deoxidation products, (iii) residual ladle slag of the previous heat, (iv) wear of the ladle lining, and (v) slag forming agents charged into the ladle. For efficient desulphurization, steel is required to be deoxidized and slag carry-over from primary steelmaking furnace is to be minimized. Ladles lined with fireclay and alumina refractories are not suitable if low level of sulphur in the steel is to be obtained. Use of dolomite or other basic refractory lined materials are to be used for efficient desulphurization. After tapping of the liquid steel from the primary steelmaking furnace the amount of slag carried over is not known. Another unknown parameter is the loss of aluminum (Al) during tapping, which results in different amounts of Al2O3 in the slag. In secondary steelmaking it is essential to know the composition and amount of ladle slag just after tapping in order to be able to modify the ladle slag for the purpose of deoxidation and desulphurization. Normally, lime (CaO), alumina (Al2O3) and slag deoxidizer are used to modify the ladle slag. For steel desulphurization it is important to reduce the mass content of FeO and MnO to a low level. The desulphurization process uses the following different steps. Depending on the metallurgical reactors (Vacuum degassing unit, and ladle furnace etc.) these process steps need different periods of time. The available treatment time in secondary steelmaking is first determined by the casting times. The casting times in steel melting shops are in a range from 25 minutes to 60 minutes depending on several factors. In the case of a fast casting process, there is a short time available for secondary steelmaking, which is not sufficient for carrying out all the steps mentioned above. Therefore, the desulphurization process itself not only requires metallurgical knowledge but also involves a logistic aspect, which is a great challenge for the steelmaker. Synthetic slag practice is normally used for the desulphurization of liquid steel. Synthetic slag practice is adopted to meet the following objectives. For covering the surface of liquid steel to reduce the heat losses. For removal of inclusions from the liquid steel. Use of synthetic slag can desulphurize steel up to 50 % to 60 % of the original sulphur level in the steel. The desirable properties of the synthetic slag are (i) slag is to have high sulphide capacity, (ii) it is to be basic in nature, (iii) it is to be fluid to obtain faster reaction rates, and (iv) it is not to cause excessive refractory wear. Argon bubbling is normally done to obtain intensive mixing for efficient desulphurization. Using synthetic slag of desired basicity and sulphide capacity, deoxidized steel can be desulphurized to as low as 0.005 %. In ladles lined with dolomite or magnesite bricks, the major components of the initial ladle slag are CaO, Al2O3, SiO2, FeO, MnO and MgO. During ladle treatment for desulphurisation the components FeO and MnO are to be well reduced. In addition, the contents of CaO, AI2O3, SiO2, and MgO are to be kept in a suitable range in order to obtain a liquid and homogeneous ladle slag. A high surplus of CaO and MgO leads to heterogeneous slags, which has a negative influence on the process performance and hence is to be avoided. The synthetic slag normally contains CaO, Ca F2, and Al2O3 and with small amount of SiO2. The main component of synthetic slag is lime (CaO). Calcium fluoride (CaF2) increases the sulphide capacity of slag and helps fluidizing the slag. Frequently Al is present to deoxidize the liquid steel since transfer of sulphur from liquid steel to slag is followed by transfer of oxygen from slag to steel. Therefore, effective deoxidation of steel is must for efficient desulphurization. Typically, the composition of synthetic slag consists of 45 % to 55 % of CaO, 10 % to 20 % of CaF2, 5 % to 16 % of Al2O3 and up to 5 %of SiO2. This slag is pre fused in solid state. Synthetic slag practice appears to be simple and not much capital investment is needed. Certain issues related to synthetic slag practice are as given below. Desulphurization may vary from one heat to other if slag carry- over from the primary steel melting furnace is not controlled. Oxygen level of liquid steel is required to be same for consistent results. CaO is the main component. It is hygroscopic and leads to the pick-up of hydrogen (H2) in the steel. Argon bubbling is done to stir the bath. Temperature drop due to bubbling of argon can be of the order of 10 deg to 25 deg C for a heat of weight 150 tons to 250 tons. The temperature drop is resulting from radiation heat losses from the surface and heat transfer due to the argon bubbling. The slag attacks the ladle refractory. Excessive amount of CaF2 results in refractory wear. Higher tapping temperature also has an effect on the refractory wear. A pre melted slag based on CaO and Al2O3 with small amount of CaF2 can reduce the problem of refractory wear and hydrogen pick-up. Composition of CaO and Al2O3 can be selected so as to melt at 1400 deg C to 1450 deg C. Small amount of CaF2 can be added. This re-melted slag, when used for desulphurization, is found to have reduced problems associated with pre fused slag. An important parameter to characterize synthetic slag for its suitability to desulphurize liquid steel is sulphide capacity of slag. Further the extent of desulphurization depends on extent of deoxidation. Aluminum killed steel can desulphurize more effectively than the steel where either Fe-Mn or Fe-Si is used to deoxidize the steel.